If you have enjoyed this article and found it useful, please consider making a small donation to the site. One of the most important aspects of any display you can understand is the panel technology being used. Specifications alone won't give you the full picture of a displays performance, and we all know that manufacturers can exaggerate specs on paper to suit their marketing. With an understanding of the panel technology being used you will get a feel for the overall performance characteristics of the display and how it should perform in real terms. Our extensive panel search database helps you identify the panel technology (and manufacturer and part number where known) of many screens in the market. This article which follows will help you understand what the different panel technologies can offer you. A lot of manufacturers now list the panel technology as well in their specs, something which wasn't included a in the past. Here we will look at the main panel technology types, and the many different versions of each you might see in the market. TN Film panels are the mostly widely used in the desktop display market and have been for many years since LCD monitors became mainstream. Smaller sized screens (15", 17" and 19") are almost exclusively limited to this technology in fact and it has also extended into larger screen sizes over the last 7 years or so, now being a popular choice in the 20 - 28" bracket as well. The TN Film panels are made by many different manufacturers, with the big names all having a share in the market (Samsung, LG.Display, AU Optronics) and being backed up by the other companies including most notably Innolux and Chunghwa Picture Tubes (CPT). You may see different generations of TN Film being discussed, but over the years the performance characteristics have remained similar overall. 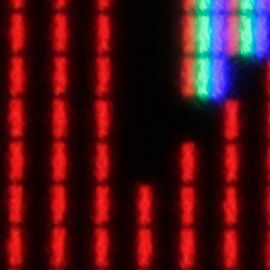 Close up macro of the sub-pixels in the TN screen in the DGM L- 2262Wd monitor. TN Film has always been so widely used because it is comparatively cheap to produce panels based on this technology. As such, manufacturers have been able to keep costs of their displays down by using these panels. This is also the primary reason for the technology to be introduced into the larger screen sizes, where the production costs allow manufacturers to drive down retail costs for their screens and compete for new end-users. The other main reason for using TN Film is that it is fundamentally a responsive technology in terms of pixel latency, something which has always been a key consideration for LCD buyers. It has long been the choice for gaming screens and response times have long been, and still are today, the lowest out of all the technologies overall. Response times typically reach a limit of around 5ms at the ISO quoted black > white > black transition, and as low as 1ms across grey to grey transitions where Response Time Compensation (overdrive) is used. TN Film has also been incorporated into true 120Hz+ refresh rate desktop displays, pairing low response times with high refresh rates for even better moving picture and gaming experiences, improved frame rates and adding 3D stereoscopic content support. Modern 120Hz+ refresh rate screens normally also support NVIDIA 3D Vision 2 and their LightBoost system which brings about another advantage for gaming. You can use the LightBoost strobed backlight system in 2D gaming to greatly reduce the perceived motion blur which is a significant benefit. Some screens even include a native blur reduction mode instead of having to rely on LightBoost 'hacks', providing better support for strobing backlights and improving gaming experiences when it comes to perceived motion blur. As a result, TN Film is still the choice for gamer screens because of the low response times and 120Hz+ refresh rate support. The main problem with TN Film technology is that viewing angles are pretty restrictive, especially vertically, and this is evident by a characteristic severe darkening of the image if you look at the screen from below. Contrast and colour tone shifts can be evident with even a slight movement off-centre, and this is perhaps the main drawback in modern TN Film panels. Some TN Film panels are better than others and there have been improvements over the years to some degree, but they are still far more restrictive with fields of view than other panel technologies. The commonly quoted 170/160 viewing angles are an unfair indication of the actual real-life performance really, especially when you consider the vertical contrast shifts. Where viewing angles are quoted by a manufacturer as 160/160 or 170/160 that is a clear sign that the panel technology will be TN Film incidentally. Movie playback is often hampered by 'noise' and artifacts, especially where overdrive is used. Black depth was traditionally quite poor on TN Film matrices due to the crystal alignment, however, in recent years, black depth has improved somewhat and is generally very good on modern screens, often surpassing IPS based screens and able to commonly reach contrast ratios of ~1000:1. 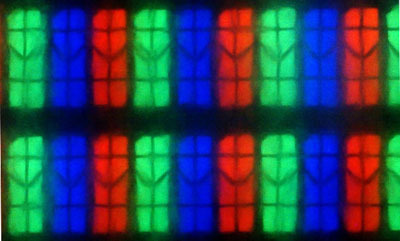 TN Film is normally only a true 6-bit colour panel technology, but is able to offer a 16.7 million colour depth thanks to dithering and Frame Rate Control methods (6-bit + FRC). Some true 8-bit panels have become available in recent years (2014 onwards) but given the decent implementation of FRC on other 6-bit+FRC panels, the real-life difference is not something to concern yourself with too much. Most TN Film panels are produced with a 1920 x 1080 resolution, although some larger sizes have become available with higher resolutions. A new generation of Quad HD 2560 x 1440 27" TN Film panels emerged in 2014. We've also seen the introduction of 28" Ultra HD 3840 x 2160 resolution TN Film panels become available, and adopted in many of the lower cost "4k" models in the market. Where used, the Anti-Glare (AG) coating used on most TN Film panels is moderately grainy - not as grainy as some older IPS panel coatings, but not as light as modern IPS, VA or equivalents. Also at the time of writing there are no ultra-wide (21:9 aspect ratio) or curved format TN Film panels in production. MVA technology, was later developed by Fujitsu in 1998 as a compromise between TN Film and IPS technologies. On the one hand, MVA provided a full response time of 25 milliseconds (that was impossible at the time with IPS, and not easily achievable with TN), and on the other hand, MVA matrices had wide viewing angles of 160 - 170 degrees, and thus could better compete with IPS in that parameter. The viewing angles were also good in the vertical field (an area where TN panels suffer a great deal) as well as the horizontal field. MVA technology also provided high contrast ratios and good black depth, which IPS and TN Film couldn't quite meet at the time. 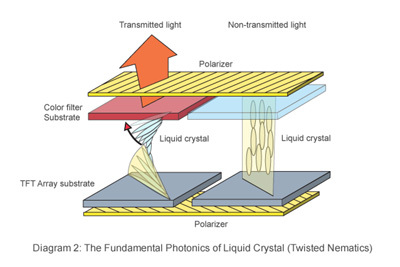 In MVA panels, the crystals in the domains are oriented differently, so if one domain lets light pass through, the neighboring domain will have the crystals at an angle and will shutter the light (of course, save for the display of white color, in which case all the crystals are placed almost in parallel to the matrix plane). As MVA developed over the years the problem became that the response times were not as good as TN film panels and was very difficult to improve. Sadly, the response time grows dramatically when there’s a smaller difference between the pixel’s initial and final states (i.e. the more common grey to grey transitions). Thus, such matrices were unsuitable for dynamic games. With the introduction of RTC and overdrive technologies, the manufacturers launched a new breed of MVA discussed in the following sections. Premium MVA (P-MVA) panels were produced by AU Optronics, and Super MVA (S-MVA) panels by Chi Mei Optoelectronics (now Innolux) and Fujitsu from 1998 onwards. AU Optronics have since entered a more recent generation referred to as AMVA (see the next section) and S-MVA panels are rarely used in mainstream monitors nowadays. When they were launched they were able to offer improved response times across grey to grey (G2G) transitions which is a great improvement in the MVA market. While responsiveness was still not as fast as TN Film panels using similar RTC technologies, the improvement was obvious and quite drastic. This was really the first time that MVA matrices could be considered for gaming, and arrived at the time when overdrive was being more widely implemented in the market. While some improvements have been made, the color-reproduction properties of these modern MVA technologies can still be problematic in some situations. Such panels give you vivid and bright colors, but due to the peculiarities of the domain technology many subtle color tones (dark tones often) are lost when you are looking at the screen strictly perpendicularly. When you deflect your line of sight just a little, the colors are all there again. This is a characteristic "VA panel contrast shift" (sometimes referred to as 'black crush' due to the loss of detail in dark colours) and some users pick up on this and might find it distracting. Thus, MVA matrices are somewhere between IPS and TN technologies as concerns color rendering and viewing angles. On the one hand, they are better than TN matrices in this respect, but on the other hand the above-described shortcoming prevents them from challenging IPS matrices, especially for colour critical work. 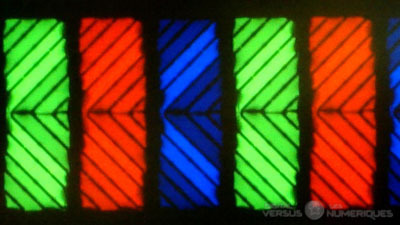 Traditionally MVA panels offered 8-Bit colour depth (a true 16.7 million colours) which is still common place today. We have yet to see any new breed of 10-bit capable MVA panel even using Frame Rate Control (8-bit + FRC). Black depth is a strong point of these P-MVA /S-MVA panels, being able to produce good static contrast ratios as a result of around 1000 - 1200:1 in practice. Certainly surpassing IPS matrices of the time as well as most TN Film panels. This has improved since with more recent AMVA panels to 3000 - 5000:1 (see next section). MVA panels also offer some comparatively good movie playback with noise and artifacts quite low compared with other technologies. The application of overdrive doesn't help in this area, but MVA panels are pretty much the only ones which haven't suffered greatly in movie playback as a result. Many of the MVA panels are still pretty good in this area, sadly something which overdriven TN Film, IPS and PVA panels can't offer. 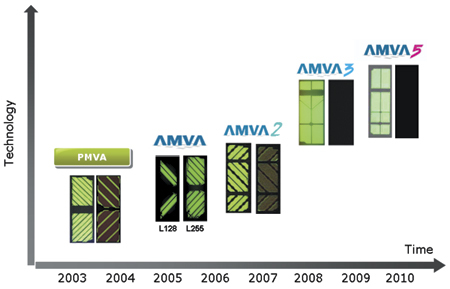 While CMO are still manufacturing some S-MVA matrices, AU Optronics no longer produce P-MVA panels and instead produce their newer generation of MVA, called AMVA (see below). AU Optronics have more recently (around 2005) been working on their latest generation of MVA panel technology, termed 'Advanced Multi Domain Vertical Alignment' (AMVA). This is still produced today although a lot of their focus has moved to the similarly named, and not to be confused AHVA (Advanced Hyper Viewing Angle, IPS-type) technology. Compared with older MVA generations, AMVA is designed to offer improved performance including reduced colour washout, and the aim to conquer the significant problem of colour distortion with traditional wide viewing angle technology. This technology creates more domains than conventional multi-domain vertical alignment (MVA) LCD's and reduces the variation of transmittance in oblique angles. It helps improve colour washout and provides better image quality in oblique angles than conventional VA LCD's. Also, it has been widely recognized worldwide that AMVA technology is one of the few ways to provide optimized image quality through multiple domains. AMVA provides an extra-high contrast ratio of greater than 1200:1, reaching 5000:1 in manufacturer specs at the time of writing for desktop monitor panels by optimized colour-resist implementation and a new pixel design and combining the panels with W-LED backlighting units. In practice the contrast ratio is typically nearer to 3000:1 from what we've seen, but still far beyond IPS and TN Film matrices. The result is a more comfortable viewing experience for the consumer, even on dimmer images. This is one of the main improvements with modern AMVA panels certainly, and remains way above what competing panel technologies can offer. AMVA still has some limitations however in practice, still suffering from the off-centre contrast shift you see from VA matrices. Viewing angles are therefore not as wide as IPS technology and the technology is often dismissed for colour critical work as a result. As well as this off-centre contrast shift, the wide viewing angles often show more colour and contrast shift than competing IPS-type panels, although some recent AMVA panel generations have shown improvements here (see BenQ GW2760HS for instance with new "Color Shift-free" technology). Responsiveness is better than older MVA offerings certainly, but remains behind TN Film and IPS/PLS in practice. The Anti-Glare (AG) coating used on most panels is light, and sometimes even appears "semi glossy" and so does not produce a grainy image. At the time of writing AMVA panels are typically offered with an HD 1920 x 1080 resolution, although some are available in sizes up to 32" maximum, at a resolution of 2560 x 1440 (Quad HD). At this time there are no native 120Hz+ AMVA panels from AU Optronics in production although at one point AUO were looking into them. Also at the time of writing there are no ultra wide (21:9 aspect ratio) or curved format MVA-type panels in production. Note: There is no AMVA4 generation. AUO developed a series of vertical-alignment (VA) technologies over the years. This is specifically for the TV market although a lot of the changes experienced through these generations applies to monitor panels as well over the years. Most recently, the company developed its AMVA5 technology not only to improve the contrast ratio, but also to enable a liquid crystal transmission improvement of 30% compared to AMVA1 in 2005. This was accomplished by effectively improving the LC disclination line using newly developed polymer-stabilized vertical-alignment (PSA) technology. PSA is a process used to improve cell transmittance, helping to improve brightness, contrast ratio and liquid crystal switching speeds. The original P-MVA generation had a four-domain orientation. 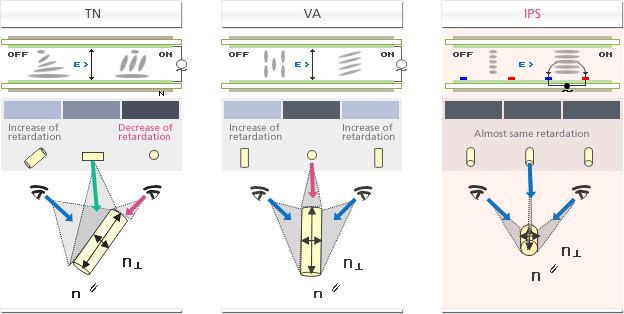 The key concept in AUO's AMVA2 in 2005 was for eight-domain VA, using a capacitive coupling method with an ART transistor that can provide improved colour-washout performance. AMVA2 is an improved version of AMVA in terms of contrast ratio. PSA was applied to AMVA3 to improve the transmittance for an eight-domain VA, and AMVA5 provides further improvements in contrast ratio and transmittance via storage-capacitor modification and colour filter material optimization. We have included this technology in this section as it is a modern technology still produced by Sharp as opposed to the older generations of MVA discussed above. Sharp are not a major panel manufacturer in the desktop space, but during 2013 began to invest in new and interesting panels using their MVA technology. Of note is their 23.5" sized MVA panel which was used in the Eizo Foris FG2421 display. This is the first MVA panel to offer a native 120Hz refresh rate, making it an attractive option for gamers. Response times had been boosted significantly on the most part, bringing this MVA technology in line with modern IPS-type panels when it comes to pixel latency. The 120Hz support finally allowed for improved frame rates and motion smoothness from VA technology, helping to rival the wide range of 120Hz+ TN Film panels on the market. Of particular note also are the excellent contrast ratios of this technology, reaching up to an excellent 5000:1 in practice, not just on paper. Viewing angles are certainly better than TN Film and so overall these MVA panels can offer an attractive all-round option for gaming, without some of the draw-backs of the TN Film panels. Viewing angles are not as wide as IPS panel types and there is still some noticeable gamma shift at wider angles, and the characteristic VA off-centre contrast shift still exists. Response time still normally slow compared with TN Film and IPS offerings. PVA was developed by Samsung as an alternative to MVA in the late 1990's. The parameters and the development methods for PVA and MVA are so different that PVA can be truly regarded as an independent technology, although it is still a 'Vertical Alignment' technology type and has many similar characteristics. PVA is a Samsung only technology. 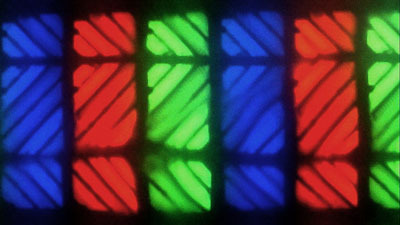 The liquid crystals in a PVA matrix have the same structure as in a MVA matrix – domains with varying orientation of the crystals allow keeping the same color, almost irrespective of the user’s line of sight and viewing angle. Viewing angles are not perfect though, as like with MVA matrices when you are looking straight at the screen, the matrix “loses” some shades, which return after you deflect your line of sight from the perpendicular a little. 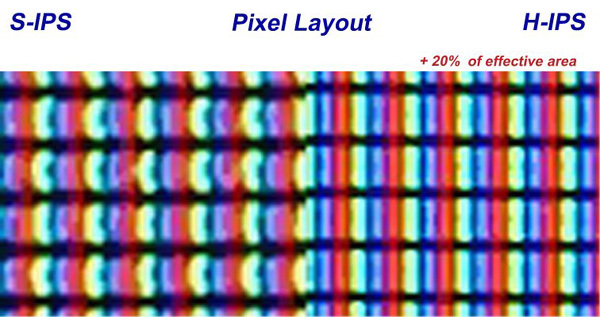 This 'off-centre' contrast shift, or 'black crush' as it is sometimes called is the reason why some colour enthusiasts prefer IPS-type displays. The overall viewing angles are also not as wide as IPS-type panels, showing more obvious colour and contrast shifts as you change your line or sight. There was the same problem with traditional PVA matrices as with MVA offerings – their response time grew considerably when there’s a smaller difference between the initial and final states of the pixel. Again, PVA panels were not nearly as responsive as TN Film panels. With the introduction of MagicSpeed (Samsung's overdrive / RTC) with later generations (see below), response times have been greatly improved and are comparable to MVA panels in this regard on similarly spec-ed panels. They still remain behind TN Film panels in gaming use, but the overdrive really has helped improve in this area. There are no PVA panels supporting native 120Hz+ refresh rates and Samsung have no plans to produce any at this time. In fact Samsung's investment in PVA seems to have been cut back significantly in favour of their IPS-like PLS technology. The contrast ratio of PVA matrices is a strong point, as it is with MVA. Older PVA panels offered contrast ratios of 1000 - 1200:1 typically, but remained true to their spec in many cases. As such at the time of their main production they were better than TN Film, IPS and even MVA in this regard. Movie playback is perhaps one area which is a weak point for PVA, especially on Samsung's overdriven panels. Noise and artifacts are common unfortunately and the panels lose out to MVA in this regard. Most PVA panels were true 8-bit modules, although some generations (see below) began to use 6-bit+FRC instead. There are no 10-bit supporting PVA panels available, either native 10-bit or 8-bit+FRC. Panel coating is generally light on PVA panels, quite similar to a lot of MVA panels. The introduction of overdrive to PVA panels lead to the next generation of Super Patterned Vertical Alignment (S-PVA) technology in 2004. Like P-MVA panels were to MVA, these are really just an extension of the existing PVA technology, but with the MagicSpeed (overdrive) technology, they have managed to make them more suitable for gaming than the older panels. One other difference is that the liquid crystal cell structure is a boomerang shape, splitting each sub pixel into two different sections with each aligned in opposite directions. This is said to help improve viewing angles and colour reproduction when viewed from the side. Limitations still exist with S-PVA and they don't offer as wide viewing angles as IPS-type panels, and still suffer from the off-centre contrast shift we've described. Most S-PVA panels offered a true 8-bit colour depth, but some did feature Frame Rate Control (FRC) to boost a 6-bit panel (6-bit+FRC). 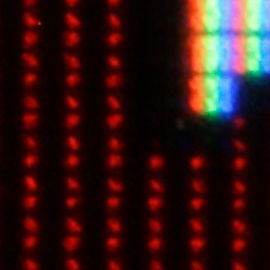 Close up inspection of the pixels making up an S-PVA matrix reveals the above. The dual sub-pixels consist of two zones, A and B, with one being turned on only at high brightness. So, the first picture shows red sub-pixels of roughly rectangular shape while the second picture shows two small pieces that represent one zone of each sub-pixel, the second zone being completely turned off. It is this two-zone structure that differentiates S-PVA from older PVA matrixes which used to have a monolithic sub-pixel divided into four domains. 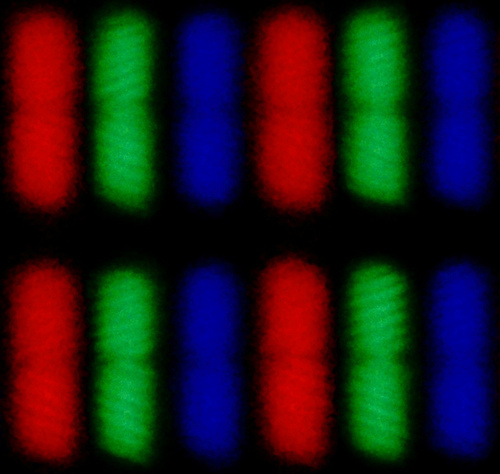 An S-PVA matrix has two zones with four domains in each, for a total of eight domains per each sub-pixel. This helps fight the gamma shift effect which occurs when not only the contrast ratio but also the gamma (i.e. 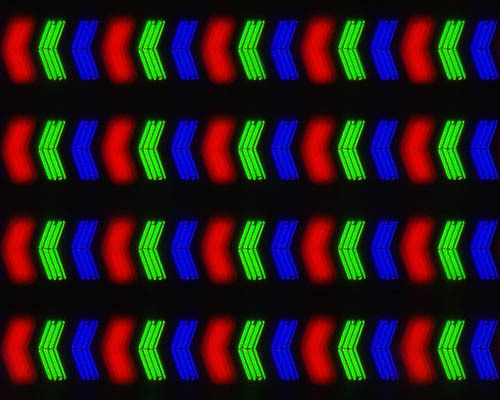 the correlation between the video signal sent to the monitor and the resulting screen brightness) changes when the screen is viewed from a side. The pixel zones of S-PVA matrixes have such shape, position and voltage (in the most expensive matrixes that are installed into some TV-sets, the two zones of one sub-pixel can even be controlled independently) as to mutually compensate the gamma shift effect for each other. Unfortunately, the gamma shift effect is not absolutely eliminated even in S-PVA matrixes. Besides, these matrixes have one more difference from PVA. Their viewing angles are asymmetric: the gamma shift is bigger from one side. In late 2009 Samsung started to produce their latest generation of so called "cPVA" panels. 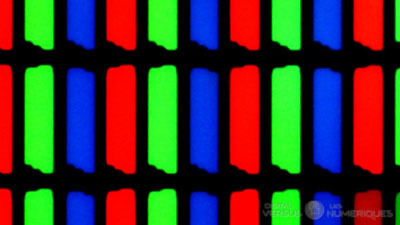 These new panels featured a simpler sub-pixel structure in comparison with S-PVA, but allowed Samsung to produce the panels at a lower cost, and drive down the retail cost of their new screens. It's unclear what the "c" stands for. This is a similar approach to e-IPS which we discuss a little later on. In practice, cPVA do not look any worse than S-PVA panels and in fact offer even better contrast ratios in early cPVA panel tests. Other performance characteristics including the off-centre contrast shift remained the same as S-PVA panels. Some cPVA panels are in fact using Frame Rate Control to produce their 16.7m colour depth (6-bit+FRC) as opposed to true 8-bit panels. See this news piece for more information about these 6-bit + AFRC cPVA panels. If you refer to the pixel structure in the S-PVA section above you will see a difference here when cPVA sub-pixels are inspected close up. As you can see, there is no sign of the sub-pixel being divided into zones. It is monolithic at any brightness. Besides, the sub-pixel has very uniform brightness. Particularly, it does not have the dark dot in the centre which can be seen in the photo of the S-PVA. This is returning to the older PVA structure of one zone, and 4 domains. Practical tests reveal that this cPVA structure doesn't seem to impact gamma or colour tone shift compared with S-PVA structure which is positive. An example of a cPVA based screen is the Samsung F2380. There is very little official information about this technology but some Samsung monitors started to be labelled as having an A-PVA panel around 2012 onwards. We suspect that nothing has really changed from S-PVA / cPVA panels, but that the term "Advanced" has been added in to try and distinguish the new models, and perhaps compete with LG.Display's successful IPS technology and AU Optronics AMVA technology where they have also added the word "Advanced" for their latest generations (see AMVA and AH-IPS). During 2014 Samsung started to label their PVA panels as SVA, although the definition is currently unknown. In fact these are probably the only remaining mass-produced PVA panels on the market. Little information is available regarding any possible changes although we expect some improvements to response times and contrast ratios. We believe PSA has been used for these panels as well, much like AU Optronics have used it for their more recent AMVA generations. PSA is a process used to improve cell transmittance, helping to improve brightness, contrast ratio and liquid crystal switching speeds. At the time of writing we have only seen this term used for their latest curved VA panels, so it may be something linked to that format. Contrast ratios of 3000:1 are now quoted for modern VA panels like this. Resolutions are offered at 1920 x 1080 and also 3440 x 1440 in ultra-wide 21:9 aspect ratio and curved formats. High refresh rate support is not offered at the moment so PVA variants are limited to 60Hz maximum. PVA now rarely used or produced in desktop monitor market. Samsung seemingly concentrating on IPS-type PLS instead. Response time still slow compared with TN Film and IPS-type offerings. 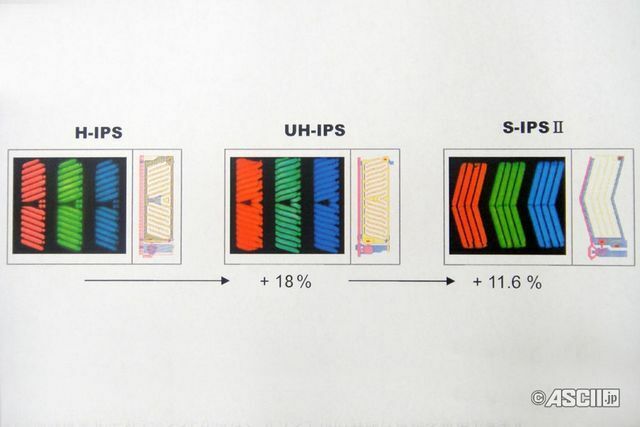 In Plane Switching (IPS - also known as 'Super TFT') technology was developed by Hitachi in 1996 to try and solve the two main limitations of TN Film matrices at the time, those being small viewing angles and low-quality color reproduction. The name In-Plane Switching comes from the crystals in the cells of the IPS panel lying always in the same plane and being always parallel to the panel’s plane (if we don’t take into account the minor interference from the electrodes). When voltage is applied to a cell, the crystals of that cell all make a 90-degrees turn. By the way, an IPS panel lets the backlight pass through in its active state and shutters it in its passive state (when no voltage is applied), so if a thin-film transistor crashes, the corresponding pixel will always remain black, unlike with TN matrices. IPS matrices differ from TN Film panels not only in the structure of the crystals, but also in the placement of the electrodes – both electrodes are on one wafer and take more space than electrodes of TN matrices. This leads to a lower contrast and brightness of the matrix. IPS was adopted for colour professional displays due to its wide viewing angles, good colour reproduction and stable image quality. However, response times were very slow originally, making IPS unsuitable for dynamic content. We will talk about the characteristics of IPS matrices in the following sections. The original IPS technology became a foundation for several improvements: Super-IPS (S-IPS), Dual Domain IPS (DD-IPS), and Advanced Coplanar Electrode (ACE). The latter two technologies belong to IBM (DD-IPS) and Samsung (ACE) and are in fact unavailable in shops. The manufacture of ACE panels is halted, while DD-IPS panels are coming from IDTech, the joint venture of IBM and Chi Mei Optoelectronics – these expensive models with high resolutions occupy their own niche, which but slightly overlaps with the common consumer market. NEC is also manufacturing IPS panels under such brands as A-SFT, A-AFT, SA-SFT and SA-AFT, but they are in fact nothing more than variations and further developments of the S-IPS technology. 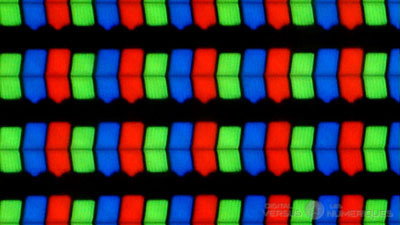 In 1998 production started for Super-IPS panels, and were mostly produced by LG.Philips (now LG.Display). They have gone through several generations since their inception. Initially S-IPS built upon the strengths of IPS by employing an advanced “multi-domain” liquid crystal alignmentt. The term S-IPS is actually still widely used in modern screens, but technically there may be subtle differences making them S-IPS, e-IPS, H-IPS, or p-IPS (etc) generations for example. See the following sections for more information. Images from LG.Display website, so take with a pinch of salt when comparing with VA! Since their initial production in 1998 S-IPS panels have gained the widest recognition, mostly due to the efforts of LG.Philips LCD (now known as LG.Display), who were outputting rather inexpensive and high-quality 19" - 30" matrices. The response time was among the serious drawbacks of the IPS technology – first panels were as slow as 60ms on the “official” black-to-white-to-back transitions (and even slower on grey-to-grey ones!) Fortunately, the engineers dragged the full response time down to 25 ms and then 16ms later, and this total is equally divided between pixel rise and pixel fall times. Moreover, the response time doesn’t greatly grow up on black-to-gray transitions compared to the specification, so some older S-IPS matrices at the time could challenge TN Film panels in this parameter. The IPS technology has always been at the top end when it comes to colour reproduction and viewing angles. Colour accuracy has always been a strong point, and even in modern displays the IPS matrices can surpass the performance of TN Film and VA equivalents. The viewing angles are a key part in this, since IPS matrices are free of the off-centre contrast shift that you can see from VA type panels. This is the reason why IPS is generally considered the preferred choice for colour critical work and professional colour displays, combining the excellent colour accuracy with truly wide viewing angles (178/178). S-IPS panels can show a purple colour when viewing dark images from a wide angle. One main problem of the S-IPS technology traditionally was the low contrast ratio. Black depth was often a problem with S-IPS panels and contrast ratios of 500 - 600:1 were common for the early S-IPS offerings. However, these have been improved significantly, and contrast ratios are now much better as a result with modern IPS generations (see following sections). One other area which remains problematic for modern IPS panels is movie playback, again with noise being present, and only accentuated by the heavy application of overdrive technologies. S-IPS panels are sometimes criticized for their Anti-Glare (AG) coating, which can appear quite grainy and dirty looking, especially when viewing white/light backgrounds in office applications. Again that has been improved significantly in recent generations. Moving Picture Image Sticking (MPIS) - S-IPS panels do not show any image sticking when touching a moving image. On the other hand severe image sticking happens in VA panel and lasts after the image is changed for a short time. Sometimes you will see these terms being used, but S-IPS is still widely used as an umbrella for modern IPS panels. In 2002 Advanced Super IPS (AS-IPS) boosted the amount of light transmitted from the backlighting by around 30% compared with the standard Super IPS technology developed in 1998. This did help boost contrast ratios somewhat, but they could still not compete with VA panel types. In 2005 with the introduction of RTC technologies (Overdrive Circuitry - ODC) and dynamic contrast ratios, LG.Display started to produce their so called "Enhanced IPS" (E-IPS, not to be confused with e-IPS) panels. Pixel response times were reduced across G2G transitions to as low as 5ms on paper. Enhanced S-IPS builds on S-IPS technology by providing the same 178° viewing angle from above and below and to the sides, and greatly improves the off-axis viewing experience by delivering crisp images with minimal colour shift, even when viewed from off-axis angles such as 45°. You will rarely see this E-IPS term being used to be honest. You may also occasionally see the name "Advanced S-IPS" (AS-IPS) being used, but this was just a name given specifically by NEC to the E-IPS panel developed and used in their very popular NEC 20WGX2 screen, released in 2006. The AS-IPS name was also (confusingly) used by Hitachi in some of their earlier IPS generations as shown below, back in 2002. 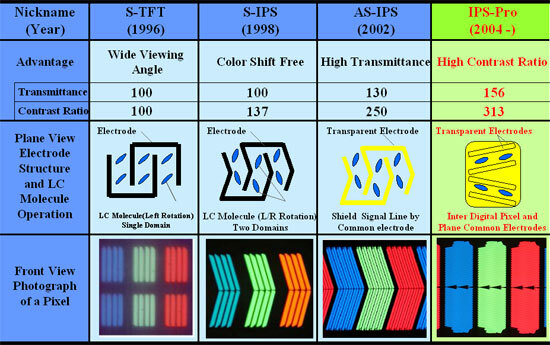 Above: Evolution of IPS as detailed by Hitachi Displays: "IPS technology was unveiled by Hitachi, Ltd. in 1995, and put to practical use in 1996. Since then, it has evolved into Super-IPS, Advanced-Super IPS, and IPS-Pro." In 2006 - 2007 LG.Display IPS panels have altered the pixel layout giving rise to 'Horizontal-IPS' (H-IPS) panels. In simple terms, the manufacturer has reportedly reduced the electrode width to reduce light leakage, and this has in turn created a new pixel structure. This structure features vertically aligned sub-pixels in straight lines as opposed to the arrow shape of older S-IPS panels. In practice, it can be quite hard to spot the difference, but close examination can reveal a less 'sparkly' appearance and a slightly improved contrast ratio. Some users find a difference in text appearance as well relating to this new pixel structure but text remains clear and sharp. H-IPS will also often show a white glow from a wide angle when viewing black images, as opposed to the purple tint from S-IPS matrices. This is actually more noticeable than the S-IPS purple tint and is referred to as "IPS glow". Some IPS panels in high end displays are coupled with an Advanced True Wide (A-TW) polarizer which helps improve blacks from wide viewing angles, and reduces some of the pale glow you can normally see. However, this A-TW polarizer is not included in every model featuring H-IPS and this should not be confused. It is very rarely used nowadays unfortunately. H-IPS panels from around this time are sometimes criticized for their Anti-Glare (AG) coating, which can appear quite grainy and dirty looking, especially when viewing white backgrounds in office applications. Close inspection of modern IPS panels can show this new H-IPS pixel structure, although not all manufacturers refer to their models as featuring an H-IPS panel. Indeed, LG.Display don't really make reference to this H-IPS version, although from a technical point of view, most modern IPS panels are H-IPS in format. As an example of someone who has referred to this new generation, NEC have used the H-IPS name in their panel specs for models such as the LCD2690WXUi2 and LCD3090WUXi screens. The following technical report has feedback from the LG.Philips LCD laboratory workers: "We designed a new pixel layout to improve the aperture ratio of IPS mode TFT-LCD (H-IPS). This H-IPS pixel layout design has reduced the width of side common electrode used to minimize the cross talk and light leakage which is induced by interference between data bus line and side common electrode of conventional IPS mode. The side common electrodes of a pixel can be reduced by horizontal layout of inter-digital electrode pattern where conventional IPS pixel designs have vertical layout of inter-digital electrodes. We realized 15 inch XGA TFT LCD of H-IPS structure which has aperture ratio as much as 1.2 times of corresponding conventional IPS pixel design." ©2004 Society for Information Display. During 2009 LG.Display began to develop a new generation of e-IPS (it is unclear what the "e" actually stands for) panels which is a sub-category of H-IPS. They simplified the sub-pixel structure in comparison with H-IPS (similar to cPVA vs. S-PVA) and increased the transparency of the matrix by producing a wider aperture for light transmission. In doing so, they have managed to reduce production costs significantly by integrating the panels with lower cost, lower power backlight units. This allowed LG.Display to compete with the low cost TN Film panels and Samsung's new cPVA generation. Because transparency is increased, they are able to reduce backlight intensity as you need less light to achieve the same luminance now. The drawback of e-IPS in comparison with S-IPS is that the viewing angles are slightly smaller. When you take a look at an e-IPS matrix from a side, the image will lose its contrast as black turns into grey. On the other hand, there is no tonal shift (as with TN and cPVA matrixes) and the viewing angles, especially vertical ones, are still much larger than with TN Film. Many e-IPS panels are actually 6-bit + AFRC modules (as opposed to true 8-bit) which might explain how the costs are kept very low in some cases, although in practice the FRC algorithm is very well implemented and you are unlikely to see any obvious side affects. Like H-IPS panels from years prior, e-IPS panels are sometimes criticized for their Anti-Glare (AG) coating, which can appear quite grainy and dirty looking, especially when viewing white backgrounds in office applications. Although it's unknown what the "e" stands for here, it's likely that it means "economic" or similar, since these new panels are all about trying to keep production and retail costs low. With lower retail costs there is of course an added risk of inter-panel variance, which may lead to some quality control issues in some models. These are new names which some manufacturers seem to promote a little around 2009 - 2010. It has been stated that these 'new' panels offer improved energy efficiency, but it's unclear what the new letters stand for. Perhaps the 'UH-IPS' stands for 'Ultra Horizontal-IPS'? It certainly seems these are just slightly updated versions of H-IPS panels as was e-IPS. It's possible as well that UH-IPS is just the same thing as e-IPS, with different manufacturers using different terminology to try and separate their displays. We suspect that UH-IPS is either the same thing as e-IPS, or a sub-category of that development, which in turn is a sub-category of H-IPS. Some spec sheets from LG.Display give some clues as to the differences. The lines separating the sub-pixels are smaller than with H-IPS and therefore the UH-IPS technology has an 18% higher aperture ratio. 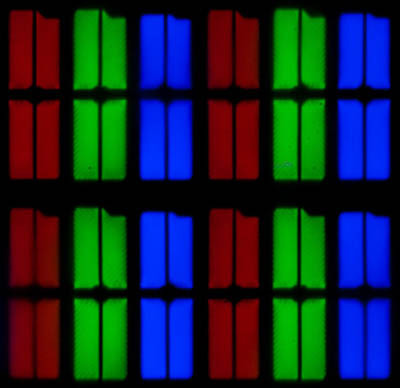 The drive for increased LCD panel transmissivity is not for the purpose specifically of increasing on screen brightness, but rather to maintain brightness and reduce backlight lamps, inverters, and optical films in order to lower panel costs. LG have used this terminology with some of their LED backlight monitors. 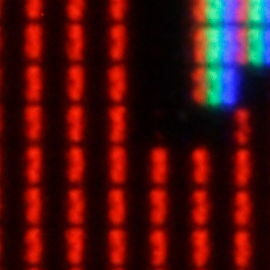 Above: Close up macro photo of UH-IPS / H2-IPS structure from HP ZR30W screen. Another term used by some manufacturers around 2010 with the launch of their IPS screens. This "S-IPS II" reportedly has an even higher aperture ratio than UH-IPS (11.6% higher), further improving brightness and contrast and helping save energy. It looks also from the information available (above) that the pixel structure has been altered and is no longer vertical as with H-IPS, but more like the traditional S-IPS / AS-IPS "arrow" layout. This looks more like an e-IPS type development, but returning to the older S-IPS pixel layout as opposed to developing H-IPS. This was a new name which NEC introduced in early 2010 with their new PA series of screens. Thankfully they've been kind enough to tell us what the 'p' stands for in their marketing, giving rise to the generation of 'Performance IPS' panels. This new panel name is being used in the new 24" - 30" sized screens (PA241W, PA271W and PA301W). In fact the p-IPS name is just a sub-category of H-IPS technology, being created as a way for NEC to distinguish their new "10-bit" models from the rest of their range. In addition, when you look into the details of it the panels are actually an 8-bit module with 10-bit receiver, giving you an 8-bit + FRC module. This is capable of producing a 1.07 billion colour palette (10-bit) through FRC technology but it is not a true 10-bit colour depth. There are very few true 10-bit panels out there in the market, although a 24" 10-bit module was features in the HP LP2480zx for instance, but at a much higher cost. Some other high end models use true 10-bit panels as well, but you need to be a little wary of manufacturers specified 10-bit figures as they are not always 100% accurate. It's all very well saying a panel is capable of 10-bit colour depth (1.07 billion colour palette) as opposed to an 8-bit colour depth (16.7 million colours), but you need to take into account whether this is practically useable and whether you're ever going to truly use that colour depth. Apart from the requirements of your application, operating system, graphics card and software, one more pertinent limitation is from a display point of view, where there must be an interface which can support 10-bit colour depth. At the moment DisplayPort and Dual-link DVI are the only options which can. A full 10-bit work flow is still extremely uncommon in the current market. 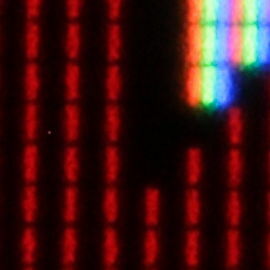 Regardless of whether you have a true 10-bit colour depth being displayed, a screen with 10-bit capabilities still has its advantages. The monitor should still be capable of scaling the colours well, even from 24-bit sources. Most of these 10-bit panels will also be coupled with extended internal processing which will help improve accuracy and these are better translated onto a 10-bit panel than they would be onto an 8-bit panel, giving less deviation and less chance of banding issues. This term was introduced by LG.Display in 2011 and primarily used when talking about their smaller panels, used in tablets and mobile devices. The term "Retina" (introduced by Apple) has also been used to describe these new panels, offering increased resolution and PPI. That seemed to be the main focus of AH-IPS panels when first introduced although they also offered an increased aperture size, allowing for greater light transmission and lower power consumption as a result. In the desktop monitor market the term "AH-IPS" has been used by several manufacturers in an effort to try and distinguish their new models, when in fact many could equally be described as H-IPS or e-IPS. With the high resolution aspect in mind, the modern 27" 2560 x 1440 IPS panels could sensibly be referred to as AH-IPS and the term has been used for some of the very recent panels. In fact there have been a couple of other changes in IPS based screens at around the same time (2012) with the introduction of wide gamut GB-r-LED backlighting, and the change in the Anti-Glare (AG) coating being used. With older S-IPS / H-IPS panels often being criticised for their grainy AG coating, this new lighter coating offers improved picture quality and sharpness. The term AH-IPS seems to be widely used now in 2014/2015 for modern IPS panels, and with the arrival of other ultra-high res panels we expect it to be used for some time. Performance characteristics remain very similar to older H-IPS and e-IPS panel generations overall. Response times are generally very good nowadays, with quoted specs as low as 5ms G2G common. They aren't quite as fast as modern TN Film panels still in most cases. Only very recently (2015) have high refresh rate IPS-type panels been introduced, although not by LG.Display (see AHVA section). At the time of writing there is no native support for 120Hz+ refresh rates at this time from LG.Display manufactured IPS-variants. Some Korean manufactured displays featuring IPS panels are capable of being "over-clocked" to 100Hz+ but this is not officially supported by the panel, and can really vary from one screen to another. Furthermore, response times are not adequate to provide optimum gaming experience in most cases, despite the improved refresh rate. Contrast ratios were typically around 700 - 800:1 in practice up until a couple of years ago, but some can reach up to around 1000:1 - 1100:1 in the better cases nowadays. They are still not capable of challenging VA-type matrices in this area. Viewing angles are still wider than those offered by VA and TN Film panels, with a more stable image and less contrast/colour shift across the panel. They are also free from the off-centre contrast shift issue seen on VA panels. When viewed from an angle, dark content can show a pale / white glow which some user find distracting. This so-called "IPS glow" can be problematic on larger screen sizes, especially when working in darker environments or with a lot of dark content. It is often mistaken for backlight bleed, when in fact the glow changes as you change your line of sight or move further away from the screen. LG.Display's IPS panels are available in a wide variety of sizes and resolutions, including panels with Ultra HD (3840 x 2160), 4k (4096 x 2160) and even 5k (5120 x 2880) resolutions. A lot of their current focus seems to be on ultra-high DPI screens like this, and they are also investing in ultra-wide 21:9 aspect ratio and curved format displays in various sizes, up to 34". Sub-pixels in the PLS (1280 x 800 pixels) screen in the Samsung Galaxy Tab 10.1. PLS was introduced by Samsung at the end of 2010 and designed to compete with LG.Display's long-established and very popular IPS technology. It is an IPS-type technology and for all intents and purposes can be considered IPS, just being manufactured by another company. Samsung claimed they had reduced production costs compared with IPS by about 15% and so were making a play at the market of IPS panels when it was launched. At the time it was also being dubbed "S-PLS" (Super-PLS) but that name seemed to be dropped quite quickly in favour of just "PLS". It wasn't until mid 2011 that the first PLS displays started to appear, fittingly they were manufactured by Samsung themselves. 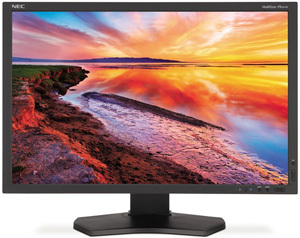 The Samsung S27A850D was the first of its kind and its overall performance certainly reminded users of IPS panels. Response times are very comparable to IPS matrices, with 5ms G2G being the current lowest spec on paper. There is currently no support for refresh rates above 60Hz from Samsung PLS panels, although there are some Korean manufactured screens which can be over-clocked to 100Hz refresh rates. This is not natively or officially supported though. Contrast ratios are typically around 700 - 900:1 in practice, although can reach up to 1000:1 in some cases as per their spec. Viewing angles are very comparable to IPS as well with wide fields of view and freedom from the off-centre contrast shifts you see from VA panels. From a wide angle dark content has a pale / white glow to it like modern IPS panels, again leading to a fair amount of so-called "PLS-glow" which can be distracting to some users. AG coating is also light, much like the light coating used on modern AH-IPS panels from LG.Display. All in all, PLS is very comparable in practice to IPS. It should be noted that some display manufacturers market their screens as using an IPS panel, whereas underneath the hood the panel is actually a Samsung PLS matrix. Testament to how close these technologies are really considered although somewhat mis-leading. Samsung have largely moved away from their focus on PVA panels and are concentrating on PLS (and TN Film still) now instead. At the time of writing PLS panels are typically available in sizes between 23 and 27" with resolutions up to 2560 x 1440. They do also have a 31.5" panel with Ultra HD 3840 x 2160 available which is currently their largest. They do not currently manufacturer any ultra-wide 21:9 aspect ratio of curved format panels. In 2012 some PLS based screens started to be marketed using the "AD-PLS" name. It is unclear what is supposed to have changed, if anything, with these recent panel variants. We suspect this is just a marketing name designed to keep up with LG.Display's change to the "Advanced High-Performance IPS (AH-IPS)" name from the same time. Performance characteristics remain as described in the PLS section above. Again like Samsung's PLS technology, AU Optronics have invested in their own IPS-type technology since 2012, dubbed AHVA. This technology is designed by AU Optronics as another alternative to IPS. Confusingly the AHVA name makes it sound like it's a VA-type panel, which AU Optronics have been manufacturing for many years. It should not be confused with AMVA which is their current "true" VA technology produced. The BenQ BL2710PT was the first display featuring this new technology and gave us some insight into the performance characteristics of AHVA, confirming how closely it resembled an LG.Display IPS panel. Response time specs reach as low as 4ms G2G on paper but in reality the matrix does not perform any better than the faster IPS or PLS panel versions. Contrast ratios can reach up to the advertised 1000:1 and viewing angles are also very comparable to IPS. There is no off-centre contrast shift like you see on normal VA panels, but a pale glow is visible on dark content from an angle like with IPS/PLS. The AG coating is very light, often semi-glossy. In very recent times (2015) AU Optronics have been the first to release official high refresh rate (144Hz) IPS-type panels, through their AHVA technology. The first display to use one of these panels was the Acer Predator XB270HU which was impressive when it came to refresh rate support and response times. We expect further panels to emerge at a later date with 120Hz+ refresh rates which can only be a good thing when it comes to gaming. 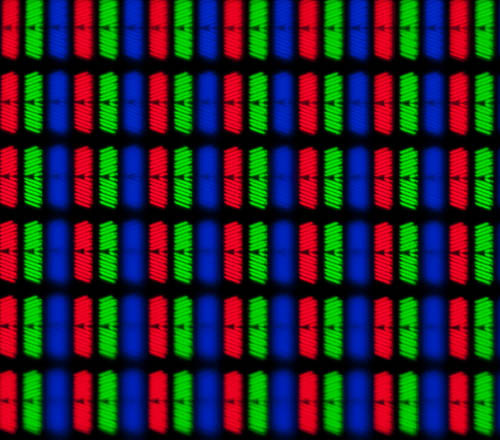 With the addition of this high refresh rate we also saw the first inclusion of a blur reduction backlight (from the NVIDIA ULMB mode) on an IPS-type panel. Again a positive sign when it comes to the gaming future of IPS-type panels. AU Optronics have invested in various panel sizes for AHVA ranging from 23.8" up to 32" in size. They offer resolutions also up to Ultra HD 3840 x 2160 currently, but lacking 4k or 5k support. They are currently investigating a 27" curved AHVA panel with 2560 x 1440 resolution but it has yet to be released, and if it does make it to production would be the first AHVA panel with a curved format offered. They have yet to investigate 21:9 aspect ratio ultra-wide panels though.